I recieved this award from the lovely Kristyn from Paint That Nail. Thank you Kristyn! - After I did my re-exam I finally succeeded to graduate! Now on to the next study! - I'm wearing glasses for the last few months now, just for watching tv, goodbye headaches! - I write my blogposts everyday, I just make them before when I can't do it else, I hate to write a week of posts in just one day. 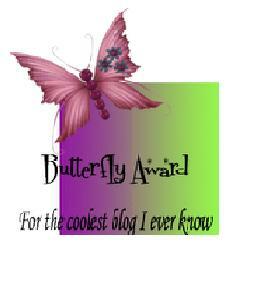 I like to blog everyday! - I'm going on my vacation very soon! But blogging goes on, so that's the only time that I'm making blogposts for a while instead of 'live'. - I seriously don't understand why some of the 'beautybloggers' name their blog an online magazine. Come on people there is a huge difference between a magazine or a blog, I'm definitely not taking you serious because you think your blog is an online magazine. - I hate public transport. And guess what? The next 4 years I have to travel by train for almost 2 hours every day, that's a big hell for me! - I can't bare a day without the internet, even when I'm on my vacation I can go on the internet, ah well not every day but I can check my email/blog at least. Name your favorite colour: Definitely purple! But that wasn't a big surprise isn't it? Name your favorite song: Hmm that's a hard one, I have a new favourite song almost every week. At this moment it's Gasoline by Seether. Name your favorite dessert: Banana yoghurt! I love banana's! What pisses you off: People who judge other people by the outside, learn to know that person before you judge! When you're upset you: When I'm really upset I can be very very aggressive, I want to slam the doors and knock everything. It's a good thing that's I'm not getting upset very easy, you first have to do a very bad thing before getting me upset. Best Feature: Absolutely my nails! Everyday attitude: Happy, I'm always happy and very enthousiastic, even when I'm just out of bed! What is perfection: In my eyes nothing is perfect, there isn't any perfection! Guilty Pleasure: This question made me think for more then 10 minutes, but actually I don't have a guilty pleasure (is that a good thing?). That's it for now! If you want to be part of above list of 'tagged bloggers' please leave a comment and I will add you and your blog! Jep! Daarom staat dit artikel er al zo vroeg, vanavond zal er nog een apart artikel komen met een review/swatch!